Museum display of sea scorpion (Eurypterus remipes) fossils and model; photo by Steve Lew on Flickr (noncommercial use permitted with attribution / share alike). 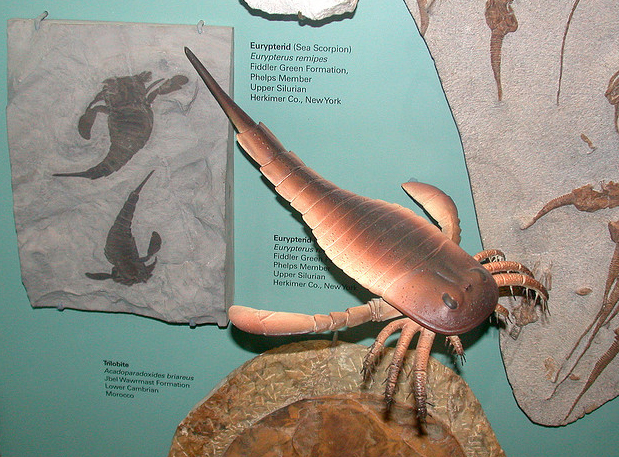 Eurypterus Remipes is an extinct relative of the modern king crab and sea scorpion. This creature lived over 400 million years ago during the Silurian Age and crawled along the bottom of the shallow, brackish sea then covering much of what is now New York state.